Portland, Oregon psychonauts Eternal Tapestry applied a certain amount of spit and polish to their sprawling psychedelic jams when they graduated to the Thrill Jockey label with last year's Beyond the Fourth Door LP. The freeform stoner epics of yore were tightened up, reined in even, but certainly arranged with a heightened sense of craft and – whisper it - discipline, that gave a new dynamism and structure to the guitar fuzz, space rock mantras and pummelling drone rhythms of their previous albums, cassettes and CD-Rs. It was entirely appropriate, and helped the band break through to a wider audience. But now, following their Night Gallery collaboration with cosmic soul brother Sun Araw, the Tap are back with this stopgap, limited vinyl release, intended to reflect more closely their blistering live show and "return to the blasted four-track sounds of [2008 album] The Invisible Landscape", prior to a new studio album later this year. In fact though, Eternal Tapestry haven't entirely abandoned the shaping instinct that served them so well on Beyond the Fourth Door. The actual raw gold from which this album was hewn was displayed on two tour-only cassette releases from last autumn; Dawn in Two Dimensions is judiciously edited from those sessions (live at "Tapestry Space" over several weeks in Spring 2011), with the sections of highest inspirations plucked, re-ordered and segued together for best effect and maximum impact. So 'Wholeodrome' kicks in hard, without build-up, riding a mid-paced push-me-pull-you riff redolent of White Hills or Loop, topped with an insinuating, echo-laden snake charmer lead guitar line and, somewhere in the background, wordless, chanting vocals lending more than a whiff of incense as Ryan Carlile tracks that wafting guitar with subtle synth and Nik Turner-like saxophone. But after just four and a half minutes it all drops away into the stoned, semi-permeable wobble of 'Bread of Dreams', an ode to ergot, the hallucinatory mould that blighted medieval baps, that steadily builds in intensity like the crazed visions from your crusty roll, Nick Bindeman and Dewey Mahood's duelling guitars darting and spiralling around Jed Bindeman's epically loose drum patterns, but cutting short just at the point of pre-convulsive mouth foaming, falling suddenly into a pretty coda of pastoral acoustic finger-picking that in turn bleeds into the propulsive fuzz raga of 'Marrow of the Wand.' This comes closer to the band's legendary early freakouts, its fourteen-minute duration encompassing a shimmering, spacious, laid-back mid-section which they take their time wandering around in without ever letting the groove unravel entirely, building almost imperceptibly back to a wah and whammy bar abusing climax. Side two of the vinyl LP is one long suite - twenty-one minutes - in three sections. The first, 'I.S.F.S. ', is the build-up, a lonesome, almost Morricone-like simple guitar riff emerging from the initial creative soup, taken up and emphasised by the other musicians, then counter-pointed and finally deconstructed into glassy shards of glistening noise. 'Dawn in Two Dimensions' hammers at the forge and revs its engines for a seeming eternity, finally drilling a wormhole through into the universe next door where a particularly dank and dirty guitar riff lurks and leers. This is 'Quantum Leap', a grunting, skronking shuffle with all hands on deck to drag a kind of misshapen funk screaming from the murk, that in the end sounds awfully like something Sister Ray said. 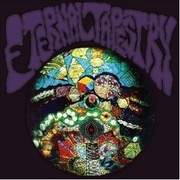 Despite having a knowing nod of humorous self-awareness about it, the name Eternal Tapestry isn't taken lightly, and Dawn in Two Dimensions has to be seen as just another contribution to the grand Persian rug of sonic snapshots the band are gradually building. Instruments, tracks, songs, even albums weave around each other (as this LP relates to the Brainwave Entertainment / Entrainment cassettes, for instance), creating new spaces in their juxtaposition before moving on, unravelling, becoming something else again. And for all the band's post-hippy, retro-stoner associations (which they're far from alone in), this quality is as contemporary and vital as, ultimately, their music is too.